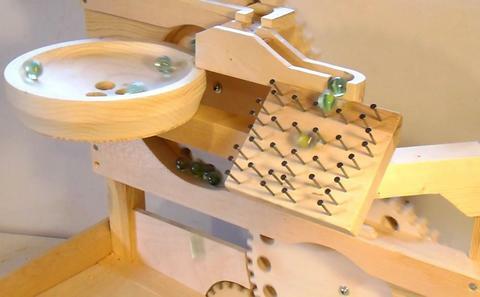 The "flipflop" at the top of the machine sends the marbles alternately left and right. As each marble passes the flipflop, it toggles the rocker in the flipflop so that the next one is sent in the opposite direction. 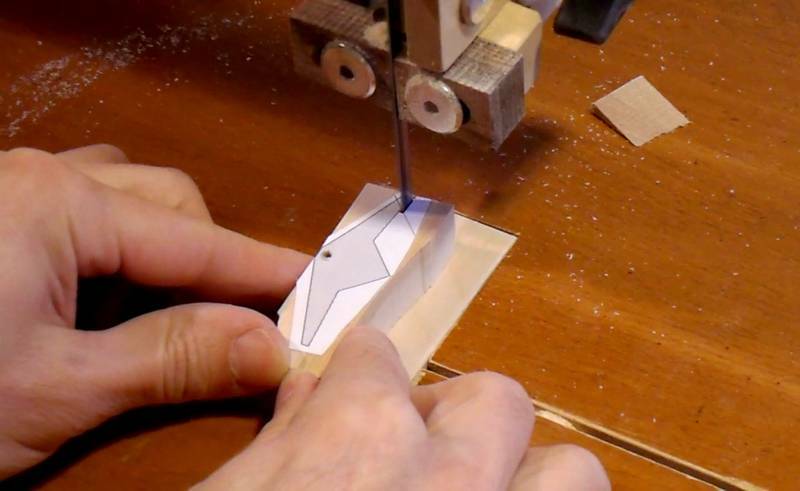 I'm cutting the flipflop parts using paper templates. 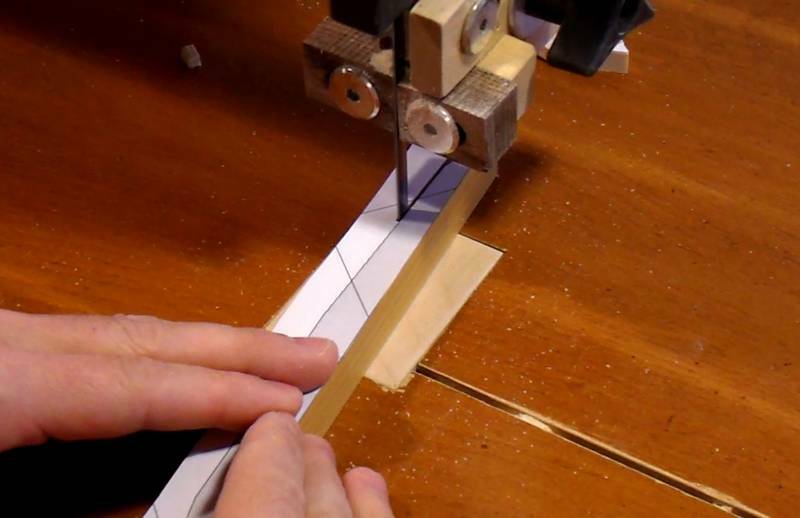 Bandsawing along the edges is accurate enough, and it saves me having to make measurements. The pieces I'm cutting out here are 7 mm thick. 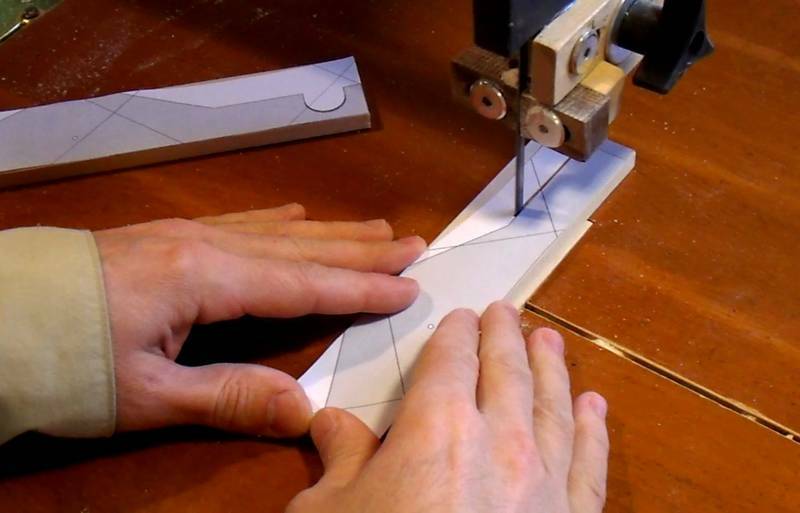 Here's cutting out the toggle. I drilled the pivot hole before cutting the outline. 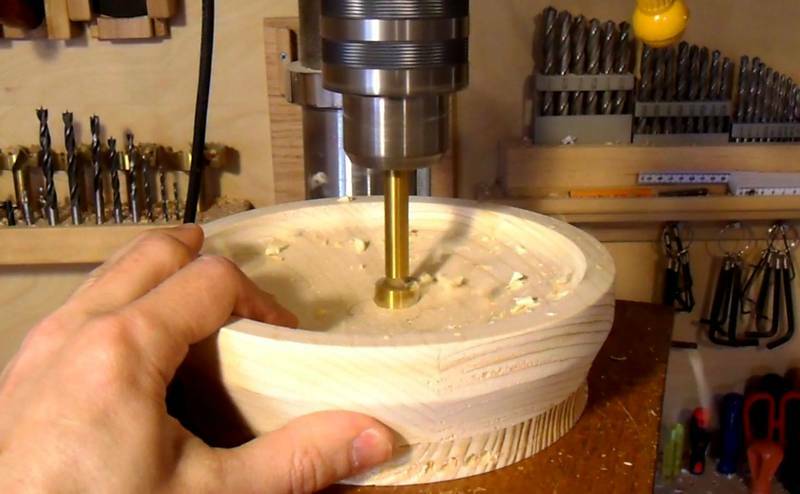 That hole is very close to the edge so it would be difficult to drill afterwards. The pivot hole is just slightly larger than the nail it will pivot on. Cutting the flipflop floor. It slopes downwards on either side. I sanded those slopes after bandsawing them to provide a smoother rolling surface for the marbles. 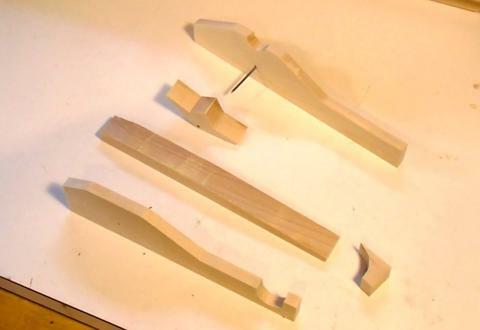 The pieces of the flipflop ready to assemble. 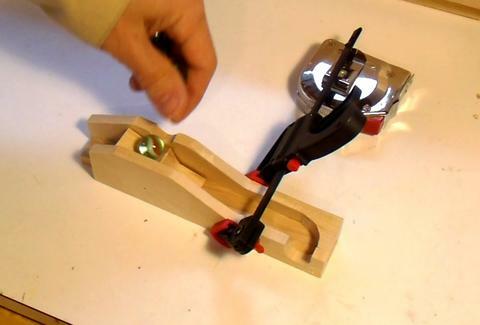 I loosely clamped the pieces together and tested it by dropping some marbles onto it. The flipflop worked OK, so here I'm gluing it together. 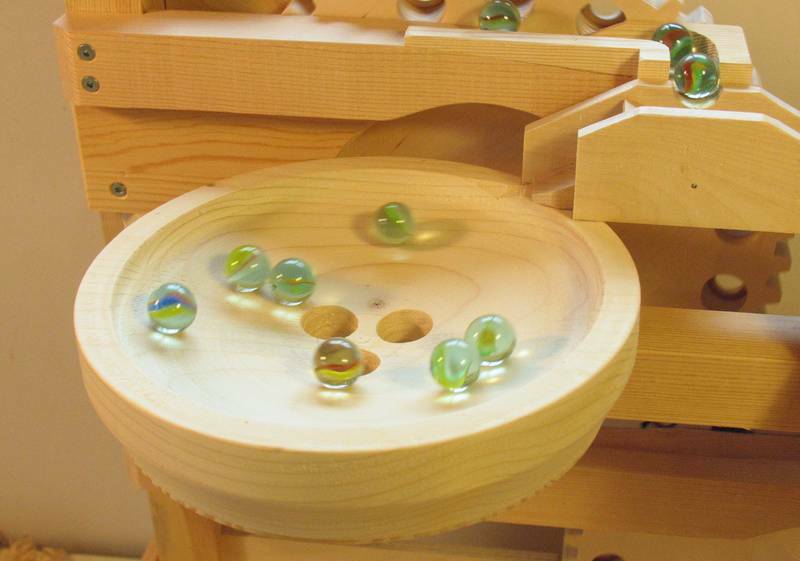 The flipflop entrance needs to be just below the exit at the top, so that marbles will roll into it freely without bouncing or using up too much height. 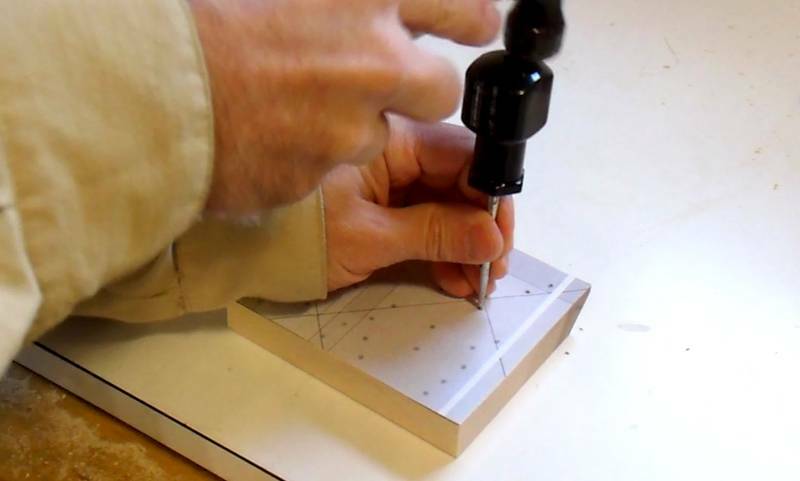 I'm holding the piece in place and marking the outline of the mating part with a pencil. 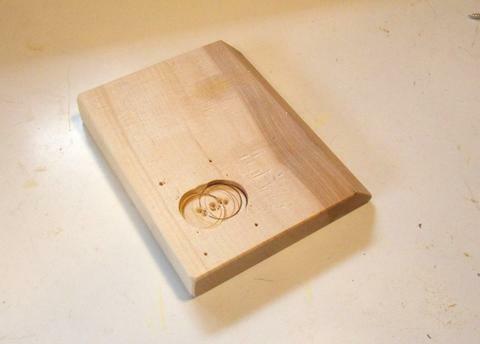 Now gluing the mounting block in place, aligned with the pencil marks I just made. The bowl is a fun element - marbles swirl around in it for a long time before dropping down one of the three holes in the middle. 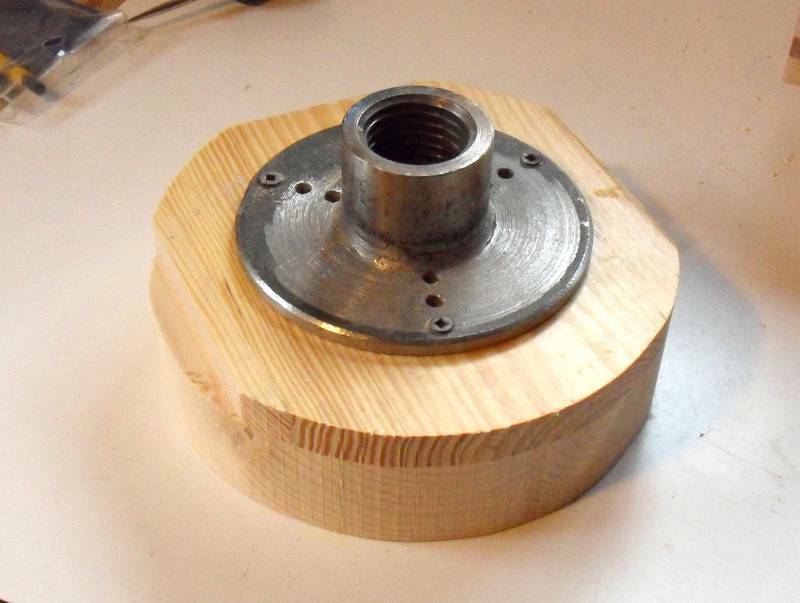 Each hole leads to a different noise making element below. The bowl needs to be 4 cm high. Regular 2x4 type lumber is not quite thick enough, so I glued on an extra board to add thickness. 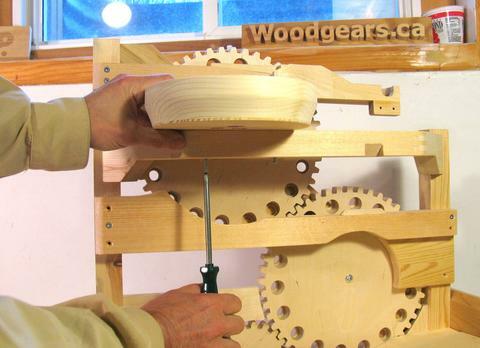 This board doesn't need to be the full size of the blank because the bowl tapers a bit towards the bottom. 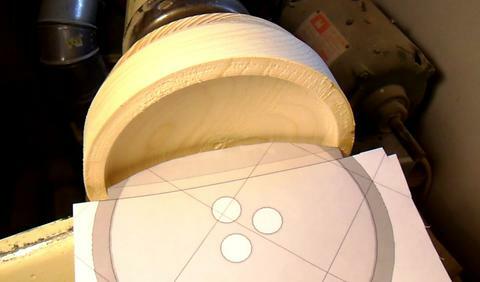 Turning the blank round, then working the face of it to cut the bowl cavity. Checking the cavity against a profile it needs to be. I had superimposed a profile view on the top view of the bowl, so that looks a bit confusing in this photo. 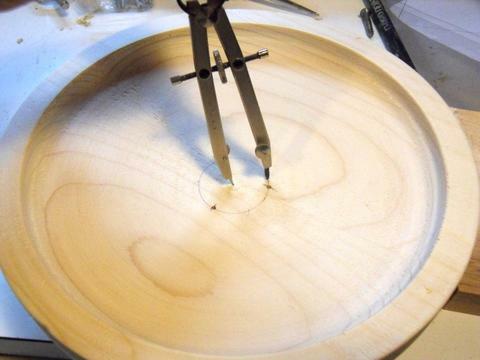 I changed the plans to have separate profiles for checking the bowl with. I'm sometimes asked how to make the bowl without a lathe. Unfortunately, I can't thnk of a good method. But you could always try building a lathe. The blank I turned was a bit thicker than needed, and I hadn't turned it all the way down. So I'm using a simple jig to slice the bottom off the bowl. With the blade all the way up, it reaches almost half way through the bowl. 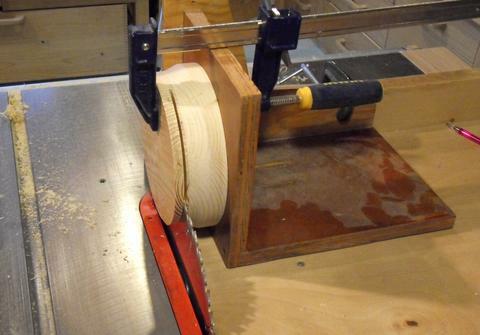 For the last few cuts, I had to put a spacer in the top side of the kerf so I could still clamp it. 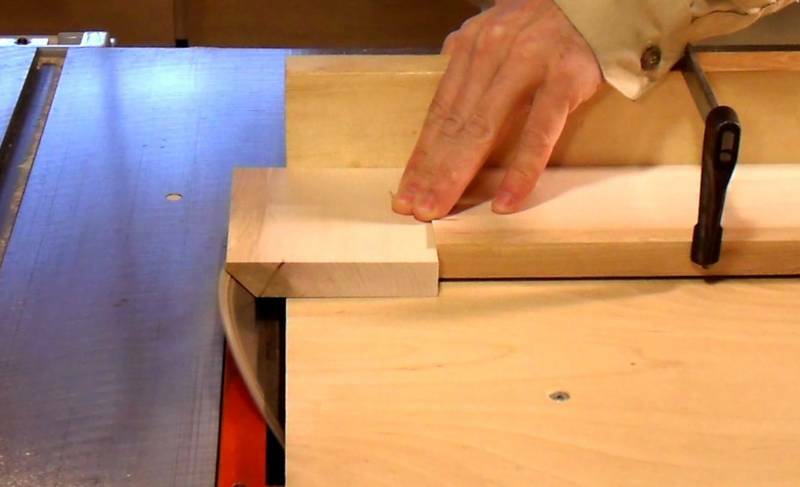 This method was the only reasonably safe method that I could think of to cut a layer off the bottom. Please note that the face of the jig also has a ledge towards the operator side, which helps to hold it steady. The clamp reaches over the top, so that even if bad things were to happen, it wouldn't fall down on the blade. 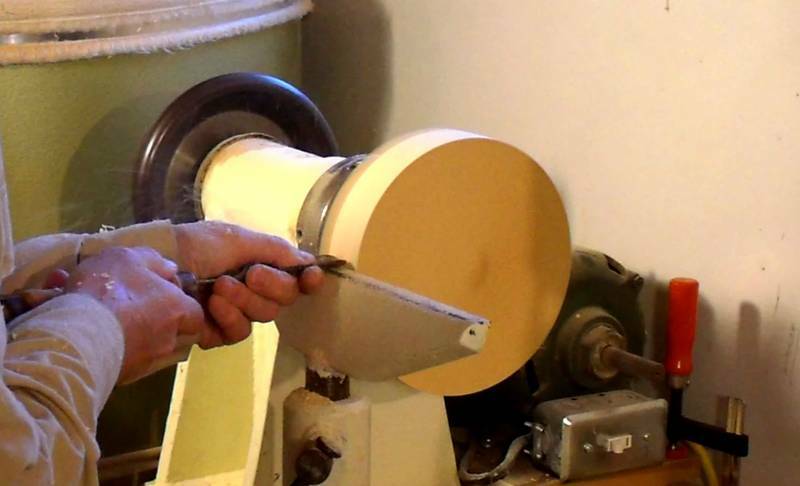 You can avoid all this trouble by making sure your blank is only slightly thicker than the final bowl. 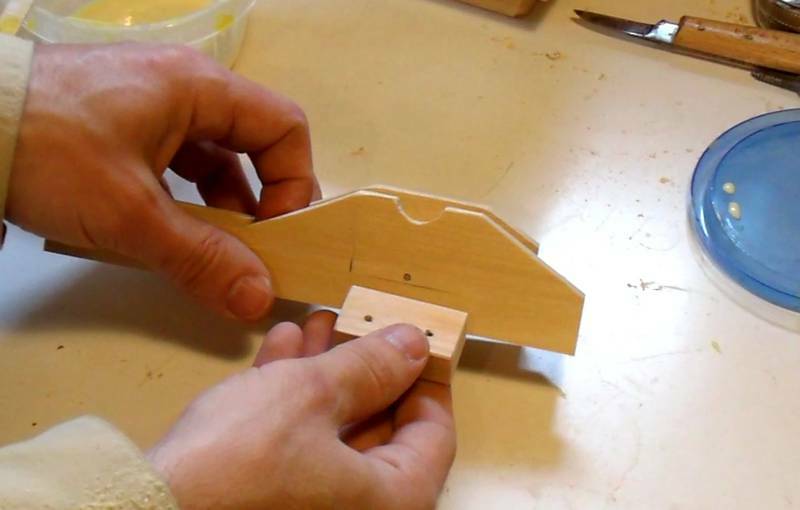 Next I mark the layout of the holes on the bottom. The holes are 3/4" (or 18 mm) in size, each 1.5 cm from the center of the bowl. They are spaced 120 degrees apart - easy enough to mark with just a compass. The orientation should be such that a line drawn between two of the hole centers is parallel to the wood grain direction. Drilling out the holes. 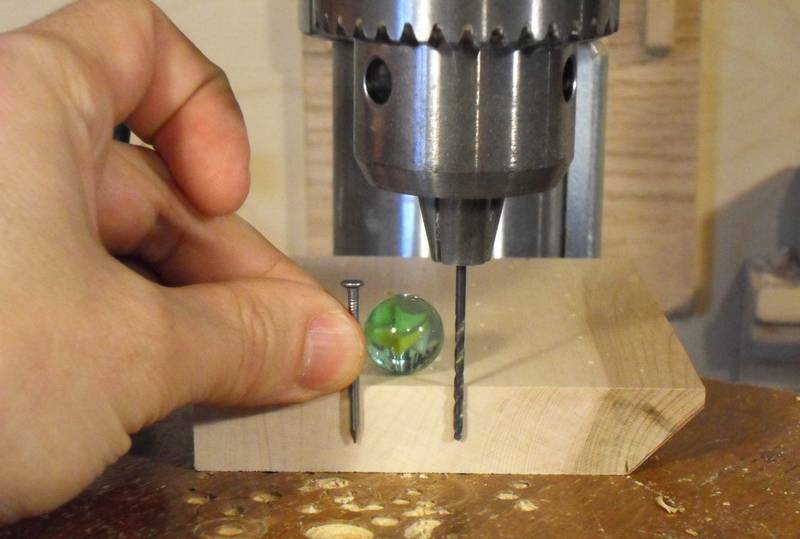 I'm using a 3/4" drill bit (19 mm). 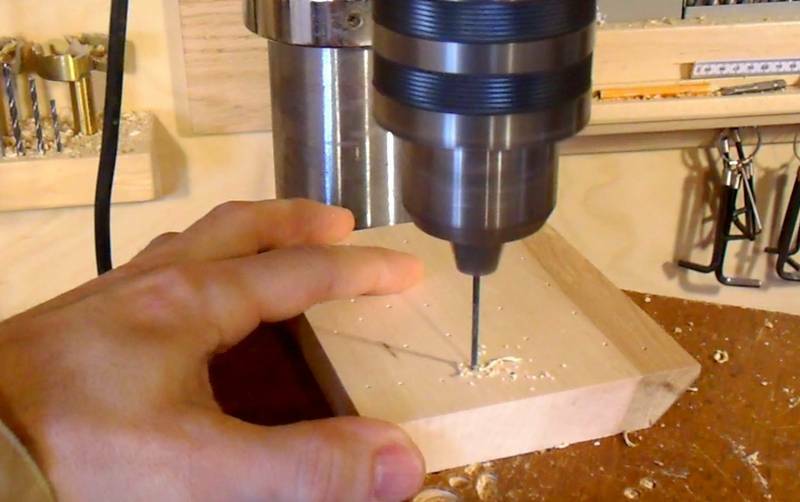 In metric countries, use an 18 mm drill bit. 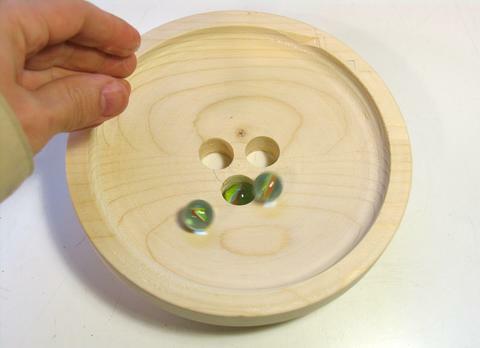 Swirling some marbles around the bowl, just to test it. 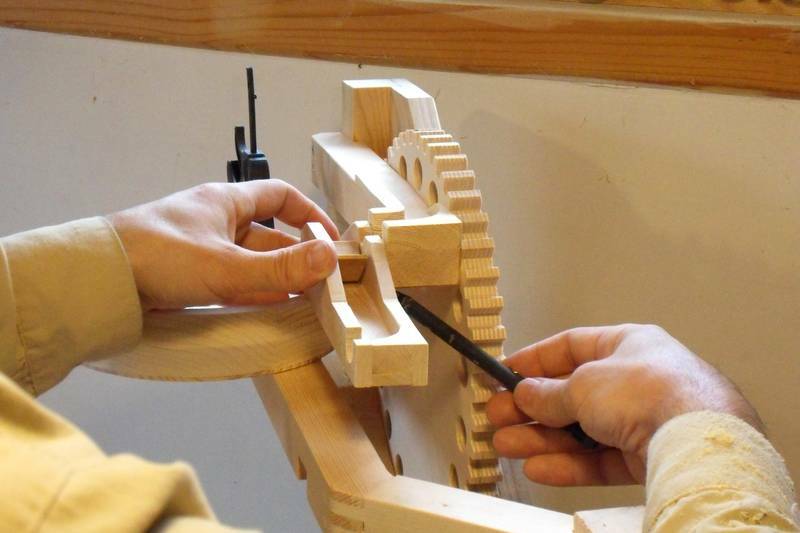 The bowl gets mounted on the support arm by two screws from below. The pin board allows marbles to bounce against the nails as they descend. 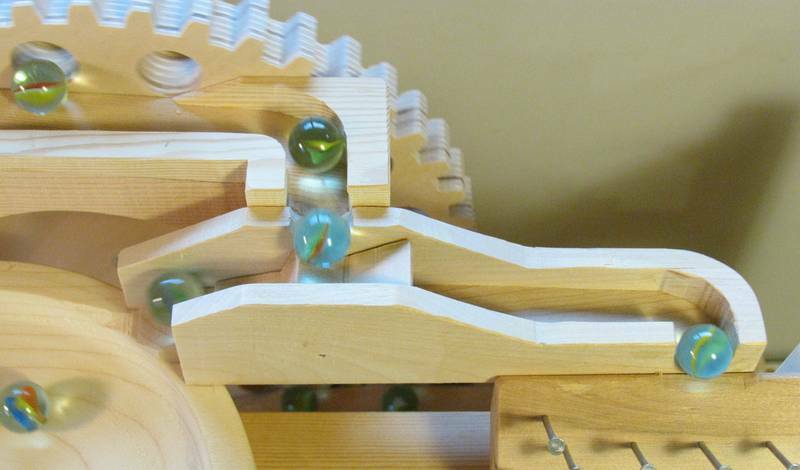 Marbles navigate the path between the nails in a surprisingly random fashion. The pin board has a 45-degree chamfer on the top edge. I cut the board to size first, at which point it was too short and wide to safely rip against the fence. 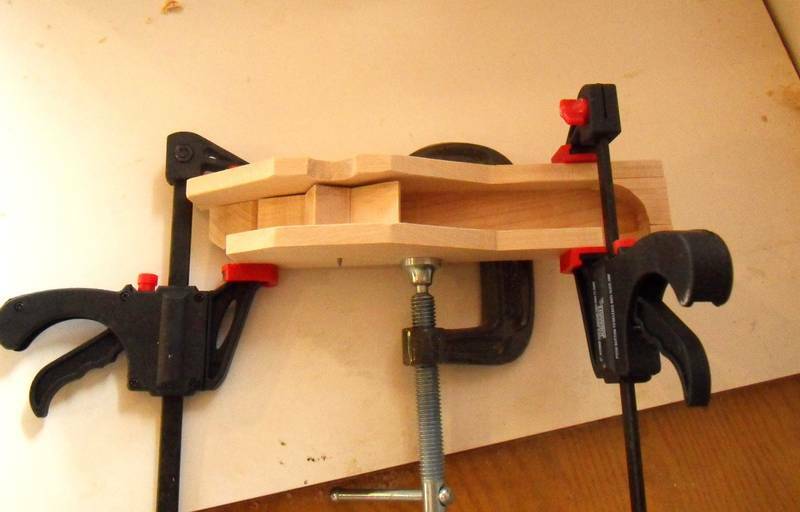 So I used my table saw sled as a support, with a stop clamped to the sled to prevent the stock sliding. 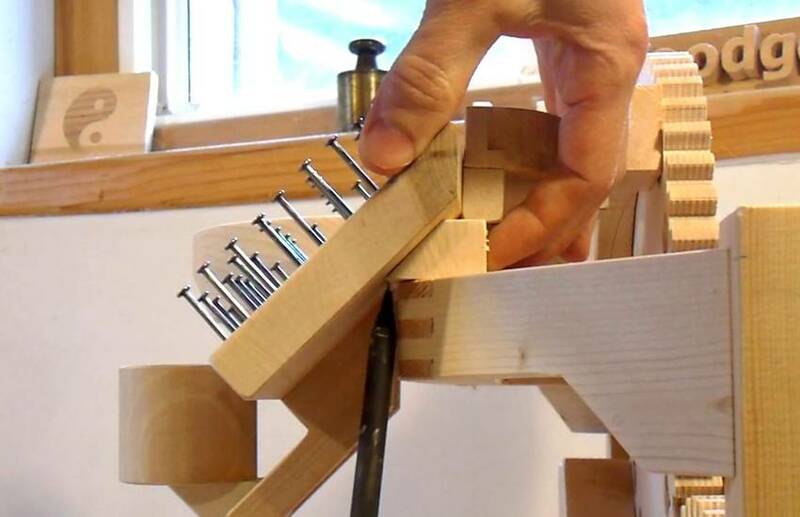 If you don't have a table saw sled, I suggest you cut that pin board longer than you need, then rip the chamfer (safer with a longer piece), and then cut it to final length. 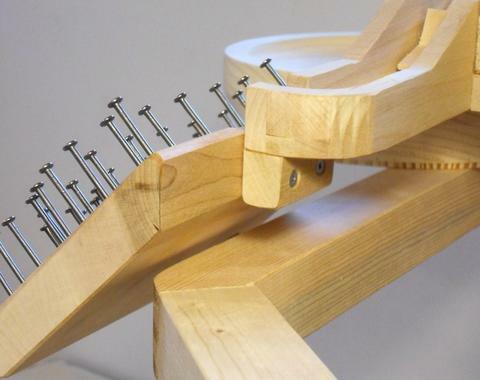 The pin board has a shallow cavity carved out of the bottom. This is to give the dump-o-matic counterweight more room. Best to cut that before adding any nails to it. I tacked the template down on the piece with just a dab of glue, and am using an awl to punch a divot through the template for every nail position. I'm using a drill just slightly smaller than the diameter of the nails I'll use. 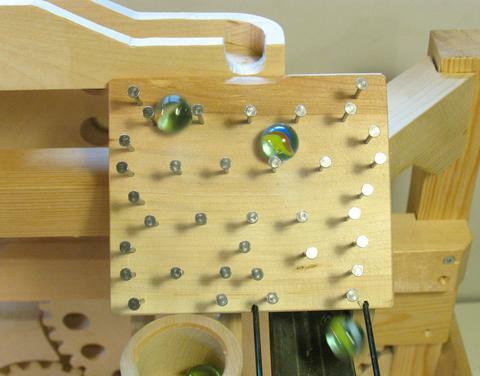 Here's checking the depth to make sure I have the nails sticking out to the right height for the marbles. 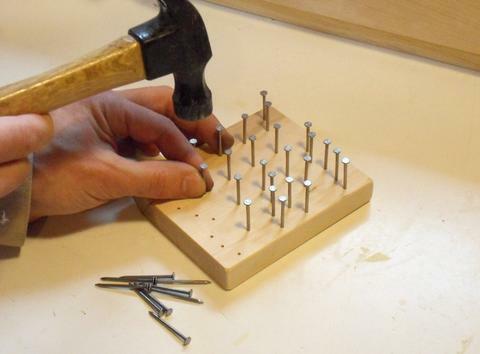 Drilling all the nail holes. With divots in all the nail positions, I didn't need the template anymore. 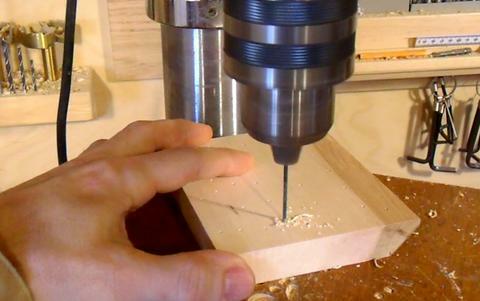 Drilling often makes a mess of the template, so I just pulled it off. It's hard to see the divots in this image, but you can click on it to enlarge it. The pin board screws to the exit of the flipflop to ensure it stays aligned properly. 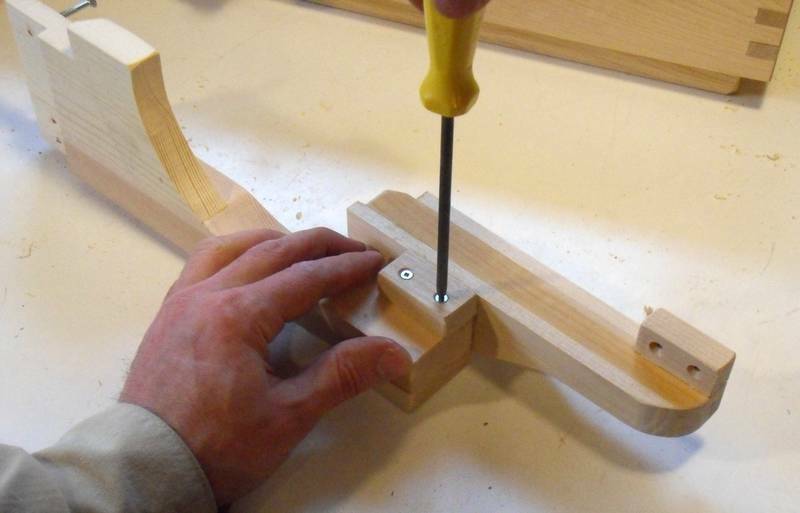 It's best to hold the pin board in place, then push the screws through the holes in the mounting block to mark the pilot hole locations. 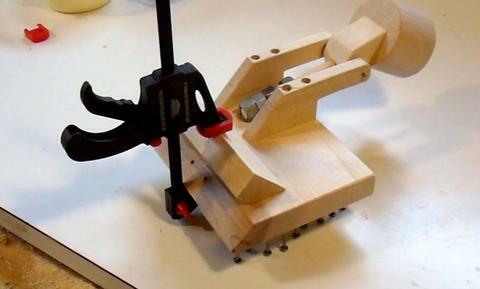 There is also a beveled block that goes between the support arm and the pin board. Here's marking where that beveled block will meet the pin board. I have that location marked in the plans drawings, but it's better to mark that off the machine as you build it. With the pin board removed again, gluing that beveled block to the pin board, making sure it's aligned with the pencil marks from the previous step. Testing the just constructed elements. It's always fun to do the testing at every step.